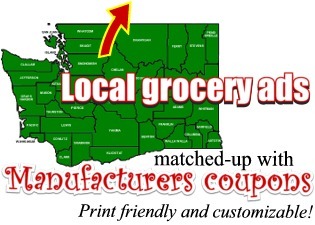 A complete listing of all unexpired manufacturers coupons that have been distributed in Eastern Washington. The code at the end of each entry means: The initials of which company printed that packet (RP=Redplum packet, SS=Smartsource packet and so on) followed by The date printed on the spine of that exact packet. If there is more than one packet from Smartsource, it is named more descriptively, (Sometimes a packet is simply named "General Mills" or "Kellogs"). The packets always have a date printed on the spine, writing it on the front can make it easier to file. "How many Sunday newspapers do I need each week to get enough coupons?" Rule of thumb: 1 Sunday newspaper per person in your household. Grocerysmarts is about "stocking-up", but only on the hottest deals each week that YOUR family will consume. Over time, your storage or pantry needs to develop a wide VARIETY of items. The cheapest way to get multiple coupons for stocking up is by getting multiple newspaper subscriptions (just for the Sunday coupons!) -Remember, your school recycle bins get paid by the pound. Filing coupon packets whole in hanging files is the easiest way to organize coupons. 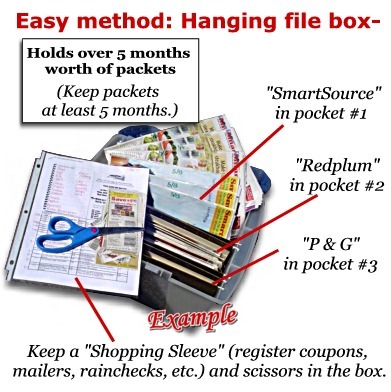 Just use 4 "large capacity" hanging file folders (2 or 3 inch "box-bottom" hanging files). In Sunday newspapers look for occasional P&G packets, and ANY OTHER packet the "same size" as the SS packet as long as it has manufacturers coupons in it. There are sometimes 2 different Smart Source packets in one Sunday paper (When this happens we refer to each packet descriptively by the cover). Also, some Sundays may have packets with a different name on them (like Kellogs or General Mills), so pay attention and keep them all. In the mail look for the Redplum and an occasional P&G. The schedule in the link below refers to the date printed on the spine of the packet. Packets that come in the mail usually arrive a few days BEFORE this date.